From the 21st-27th May Europe’s best gymnasts gather in Montpellier (FRA) for the 2012 men’s artistic European Championships. There are about 309 gymnasts expected to compete. The competition will run in the Park&Suites Arena. 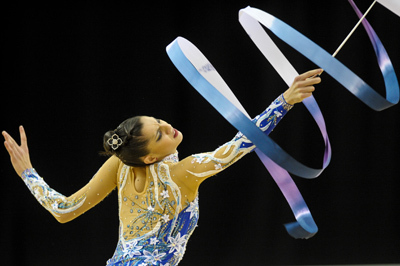 The program includes qualifying events, individual apparatus and team finals in both the juniors and seniors divisions as well as an all-around junior competition.The European Championships is the last major event before the London 2012 Olympics Games. The two-day British Acrobatic Gymnastics Championships (24/25 March 2012) at the Fenton Manor Sport Complex in Stoke-on-Trent, proved to be an outstanding display of talent and a good level of preparation for those selected to represent the country at the 2012 World Championships in Lake Buena Vista, USA, in April. In three of the disciplines the defending senior champions kept their titles, while in the other two (women’s group and mixed pair) there are new title-holders- from South Tyneside (WG) and Wakefield (MxP). Covered this event for British Gymnastics at the weekend. It was held at the Europa Gymnastics Centre in London. Great venue 12 apparatus pieces working at the same time. On the 2nd-4th March, the women’s and men’s artistic English Championships took place at the new Europa centre in Kent. One of the first major competitions in the artistic calendar, the championships saw many big names fighting for the various titles up for grabs. In the senior women’s category, Jennifer Pinches from the City of Liverpool took the title ahead of : Francis in silver and Niamh Rippin from Notts in bronze. Beth Tweddle MBE only competed on the bars but produced an almost flawless performance to score 15.9 and take the apparatus title. In the junior competition Gabby Jupp from Sapphire comfortably took gold, with impressive scores on the vault, beam and floor. Charlie Fellowsfrom Sandbach took the silver with Katy Bramley from Notts in bronze. Tyesha Mattis of East London took the espoir title with a huge score of 52.5, ahead of the younger of the Downie sisters, Ellie Downie and Amy Tinkler from South Durham in the bronze. In the men’s senior competition, Kristian Thomas took the top spot with South Essex team mates Max Whitlock and Reiss Beckford in second and third respectively. Louis Smith took the pommel horse title with 15.400. In the men’s Senior B category, Frank Baines was crowned the champion, with Brinn Bevan from South Essex taking the junior title and Donell Osbourne from Earls taking the boys. Photos online now for this event at http://www.f2images.co.uk. New galleries added daily.